Quick! Name a big country singer from the 40's 50's and 60's! A lot of people would answer Johnny Cash, Hank Snow--even Hank William's Jr.'s music was huge after his death. But Eddy Arnold topped them all in terms of number one hits. You may remember some of his smashes, "Bouquet of Roses," "Anytime," "Just a Little Lovin' (Will Go a Long Way)," "Please Help Me I'm Falling," and "Blue Eyes Crying In the Rain." He was thought of as an urban cowboy, a crooner more than a hillbilly, and he made big contributions to the world of radio. Before his 1946 string of number one hits, Arnold hosted Checkerboard Fun Fest, a hootenanny of a radio variety show featuring Rod Brasfield, Curle Fox, and The Cackle Sisters. On the other end of his halcyon days as a C&W star, in the 1960's, he hosted a series of public service announcements for Social Security, on which he strummed songs such as "Who's Sorry Now," and "Cold Cold Heart." 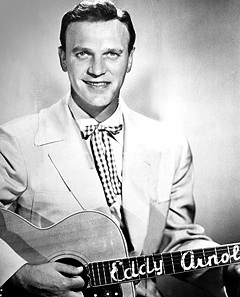 A hearty happy birthday to Eddy Arnold!